Inventory of a museum collection is not only checking everything off on a master database, but also verifying the identity and recording its location. 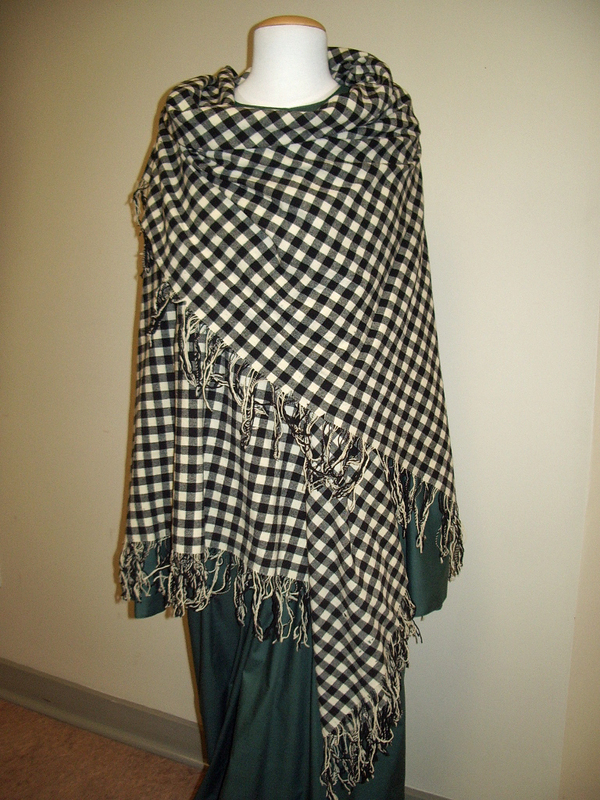 Queen Victoria’s Shawl. How do we know it is that? GOAL: Within 5-minutes of asking, any artifact record should be able to be found and the location of the artifact identified. The museum should know where EVERYTHING in the collection is located. 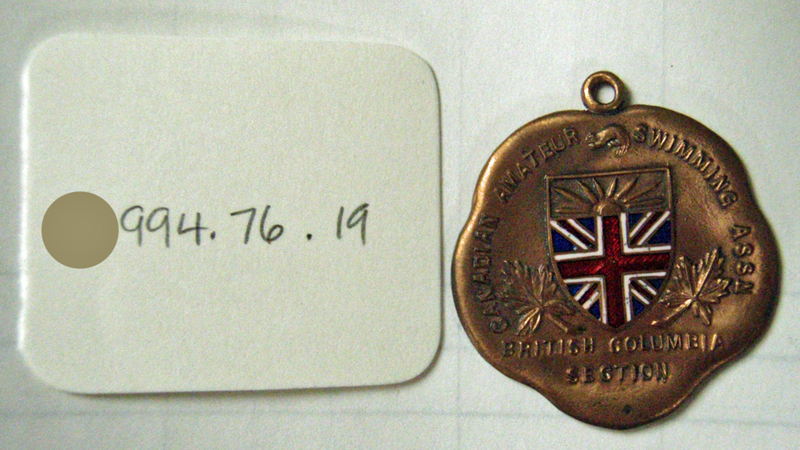 Having lovely accession and catalogue records is nice, but how do you know what is still in the museum and where it is? Sadly the greatest number of thefts from museums are not by break-in thieves but rather, by staff. Losses by careless staff, poor practices etc. account for a lot of missing items as well. YOU are accountable for everything. If something is known to have been stolen, include the report in the file. If something was deaccessioned, record in the file why this was done and what happened to it. To do an inventory, I suggest that you first sort out your accession records and work them into a single master database. You first need to designate all locations in the museum and grounds on a master locations map and list. If not already done so, assign a number to every display case, shelf, closet and other locations. location, to every room (display or storage), every shelf, closet etc. I suggest physically putting a number on each display case e.g. top right corner. An inventory with inadequate information is useless. For example at one museum I was Curator at, I found old inventory records saying that two bicycles were stored in a particular room. There were no accession numbers listed and the room was now a exhibit area without any bicycles. 2015 = The year it came in. Use the FULL 4-digit year, not just the last part of the year. Computer sorting problems have occurred for museums using three digits e.g. in that computers will sort 015 (2015) before 999 (1999). Do not worry if your artifacts are marked only with the last 2 or three digits of the year. Just include the procedure in your manual and staff training to put the full year into the database. You do not need to renumber all of the artifacts. 9 = The 9th item in the 7th donation of 2015. Pairs of items such as shoes or gloves should share a number e.g. AM2015.7.9A and AM2015.7.9B. This is for items not usually found alone. Then, work your way through the exhibits and storage areas in a SYSTEMATIC manner. Do one small area completely e.g. display case #001, then display case # 002 etc. When a display case, shelf etc. has been inventoried, MARK IT on your work sheet and physically, e.g. put a yellow circle sticker next to the shelf number. Don’t forget stand alone artifacts such as the vintage car, totem pole, train engine out side on the grounds. A golden rule is that NO ONE, not a Board President, Curator etc., moves any artifact in or out of the quarantine zone UNLESS they fill out the requisite paperwork. A local cannery museum Curator was doing inventory of a storage room and when she came back the next day, she found that Board Members had come in and rearranged the partly inventoried room, thus nullifying all of her work. A good mindset to have is to pretend that you are a police custodian. Police officers bring you evidence in murder cases etc. to store. They have to prove continuity of possession and be able to retrieve them for exhibit in court. Any lost items or items that have been tampered with can cause a court case to be thrown out of court. If that happens, then YOU are responsible for a murderer going free. We owe it to our public to be just as conscientious. Honest staff are essential. In one museum I had summer students doing the inventory. One found three $20 US gold coins, each worth about $1,000 at the time, unaccessioned, and just sitting on a shelf. To her credit sa summer student inventoried them and did not steal them. An accession number links the provenance (history of ownership and use) of the artifact to the artifact itself. The number needs to be attached to the artifact, in a way that it will not easily become separated. Ideally a method that does not damage the artifact is used but some museum workers go to the extreme and in the name of preservation, do not ensure that the number remains firmly with the object. The result is lost numbers which equate to lost history. In any museum with 50,000 or a million or more artifacts there is virtually no chance that the number will ever be reunited with the object. In trying to be super gentle with the artifact the staff have actually destroyed half of its value by failing to ensure that it’s history remains permanently linked to the object. What I am saying here is that sometimes the very minor damage caused by applying a number is far better than no damage to an artifact, but losing its history forever. 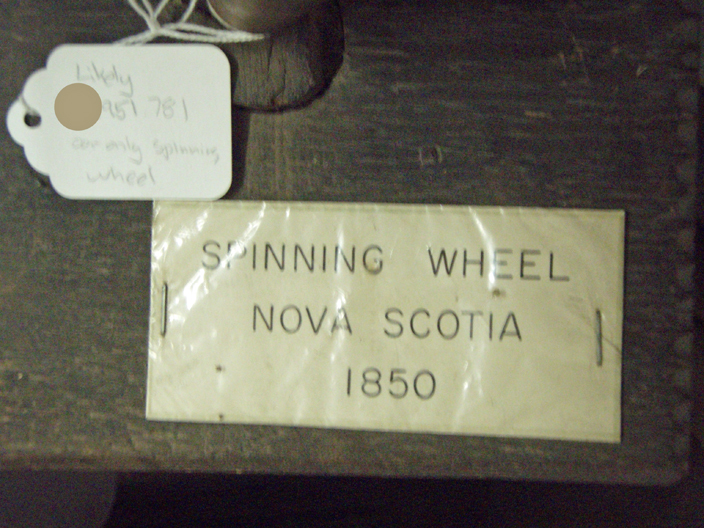 I do not recommend the stapled on label as shown below on a spinning wheel, but there are proper museum numbering methods. 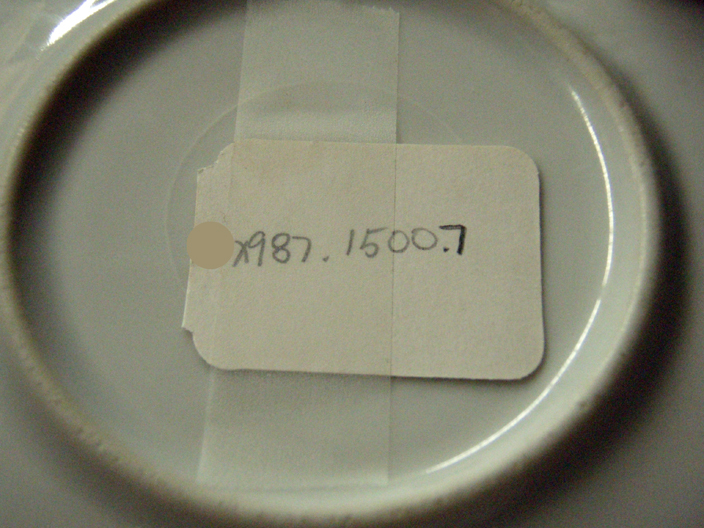 Accession number tag taped to artifact with adhesive tape – a poor practice. A tag with the accession number on it, but the tag has the string and loop cut off and just sits loose with the artifact … but for how long? A stupid practice. One proper way. Nail polish, permanent ink, then nail polish. This is on the inside of a door of a grandfather clock so it is easily found by staff without having to move the clock. Tags by the way need to be attached to the artifact where possible. One museum deliberately cut off the tie tag strings and hole in the tag, then placed the loose tag in or on the artifact! This was idiotic! Even when they left the string on, they often did not tie it on to the artifact. Suffice to say that many of these loose tags became separated from the artifacts. If no number is found on the artifact, then search the database. Using adhesive tape to attach a tag to an artifact is not recommended. Stapling the label or tag to the artifact is fefinitely NOT recommended, but it has been done. 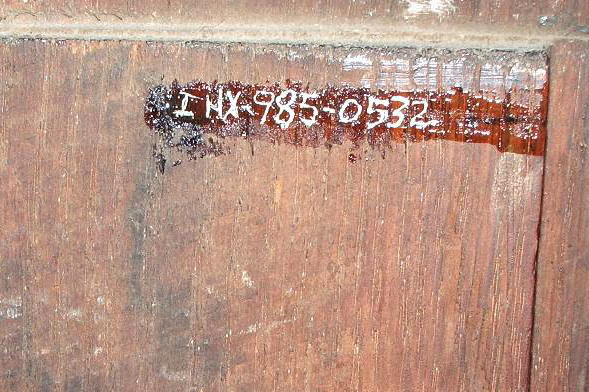 What if there is an accession number and no record to match it? When you find an artifact with an accession number but have no paper records to match it, create an entry in your database anyways and log the location. Simple observation will tell you a few things that you can record about the artifact even if you have no provenance. This safe came into a museum about 1983 and was fully documented. The records and display labels and an associated artifact have now been “lost.” In the museum’s database, they simply left out this (and other) accession number(s). The proper way is to enter it, describe the item as best you can, and do some detective work. Time does not always permit a lot of research but in this case it is a large prominent and interesting looking artifact. If only it could talk! Well, it can talk. It is pretty obvious that it was burgled safe. The handle is missing and the dial is bent from an attempt to chisel it off. 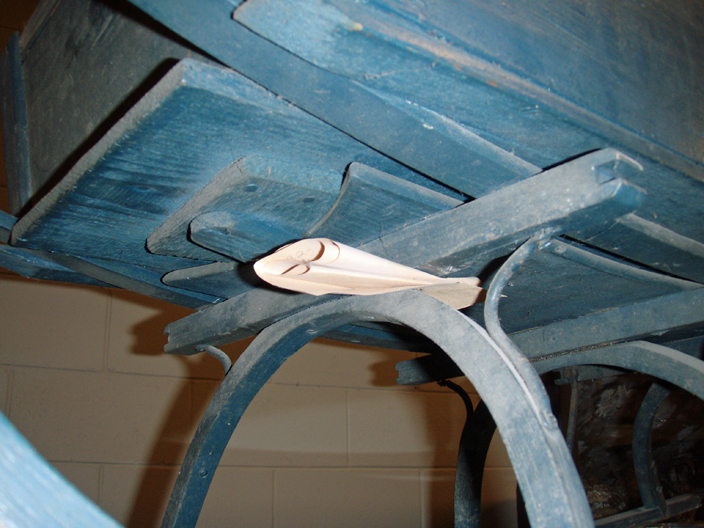 The top hinge is partly cut through by a hacksaw. The top of the safe is dented, and the left side is blown open with explosives. The accession number tells you when it was accessioned. Checking artifacts accessioned with it, just before and just after it can offer clues. Checking newspaper accounts of that year will likely reveal the story of the robbery. Asking old timers in town (a village of 2,000 or so) if they remember will likely get answers. The museum staff could try putting a sign on it saying – “Do you know the history of this artifact?” Be a detective! The staff at this museum appear to have made no attempt at all to trace the history. An obvious thing, and a technique I have often used, is to ASK FORMER STAFF! In this case, I was the known Curator of that museum for that time period [this is a key reason I suggest having, in the Registrar’s Manual, a list of staff and when they worked at the museum] , I added this safe to the collection along with the coal miner’s pick axe used to try to puncture the top of the safe. I had left written accession register, a file and display labels. Am I annoyed at the lack of detective work by the current staff? Of course I am. I visited, told one staff person the history of the safe, left my contact information (she did not think to ask for it!) so they could get more information, and I have never heard a peep from them since. An old safe which has a neatly inked accession number on an upper rear corner, but the museum has now lost all of its history. In their database they simply skipped that number. They have used no detective work to trace its history. It is also displayed in an unsafe manner. 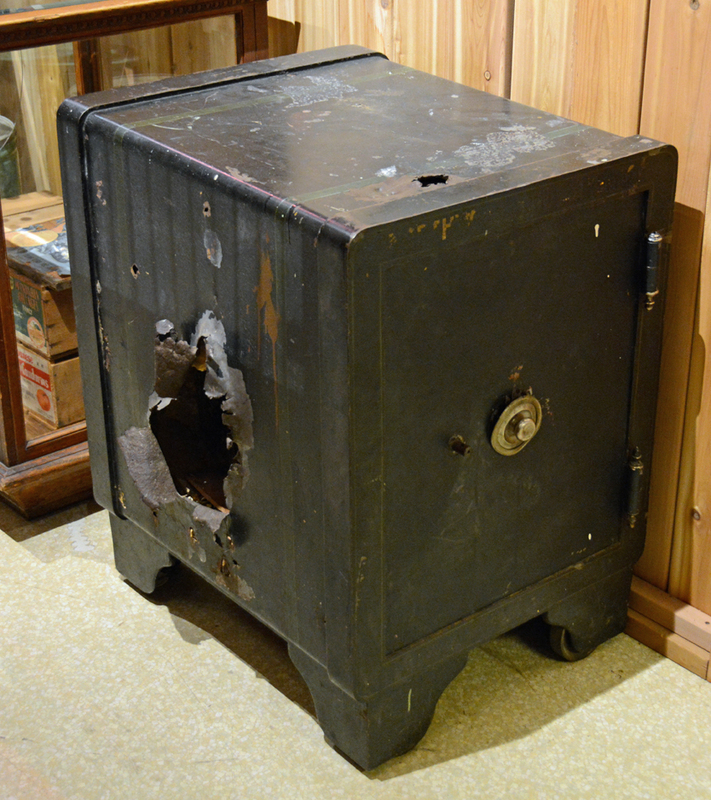 The safe, which had been sitting on big 4×4 timbers to spread the weight load, when I placed it on display about 30-years before, is now sitting directly on the linoleum and plywood floor. I had displayed it with the safe turned with the dial facing the corridor (90 degrees left of the way it is in the photo) so that the jagged edges were facing a display case but now they jut out towards visitors walking by in a narrow corridor, which could lead to serious injury. As a former Curator of that Cumberland Museum (British Columbia) I am furious that they have lost the history, had NO RECORD at all of its existence not even as a puzzle, have displayed it in a manner dangerous to visitors, especially children and have made no attempts to determine its history. It was not even in their database as safe made by XYZ with hole in side but no known history. I told the history to one of the staff. What if there is no accession number with the artifact? D. Allan Blair, the Registrar at the New Westminster Museums and Archives, came up with a great system in 2006. He called such artifacts UFOs (Unidentified, Found on Site). In such cases, if a search of the database did not reveal the artifact previously recorded, it was accessioned as if it had just come in (unless there was a clear indication in the form of a note for example of the year it had come in), and flagged as a UFO. This way the artifact could be tracked and if any research was done or history was found, then it could be linked to the artifact. If an earlier accession number was ever discovered, then it could be renumbered and the now redundant number cancelled or redirected to the earlier accession number. First you try to identify the artifact in the old accession records (now recorded in your database. Search the object thoroughly. I was once told by a senior staff member at the Royal British Columbia Museum that there is nothing so hard to find as a 1/4 inch high number on a 100′ totem pole. This brings up the point that your Registrar’s Manual should designate standard locations as much as possible for accession numbers so that they are easily found by visitors, and surprising as this will seem to many museum people (based upon what I have seen), in a place NOT easily seen by the public! DO NOT record items in the inventory with no accession number! This is a useless piece of work. At Burnaby Village Museum, a pre-1986 inventory had recorded two bicycles in a storage area that had since been converted into a Theatre exhibit. When I arrived in 1986, we had no way of knowing WHICH bicycles these were. The whole inventory was way out of date and was useless. What do you do with a bag of buttons or a box of hundreds of little objects that have no accession numbers? If you stop to accession 500 or so buttons, you will never finish. The summer students with have finished their contracts and you will be left with a problem. The technique I developed I called “Bag it and tag it” or “Pandora’s Boxes.” A bag of buttons for example with no accession numbers would be bagged and tagged with a UFO new accession number. Then they could be tracked, simply described and be under control. Later if an when time permits, (i.e. next time there is a blue moon) someone could accession the individual buttons. Now if you did not have time to decide or felt that the items should not be accessioned, they could be put in what I called “Pandora’s Boxes. These have a clear label on top and or end stating in effect “Pandora’s Box. Do not remove anything unless you are going to process it.” Do not feel guilty as these are problems left behind by your predecessors. The Pandora’s boxes should be taped shut. I used Banker Boxes which were portable and stacked nicely. These handles most items. To accession or to catalogue? 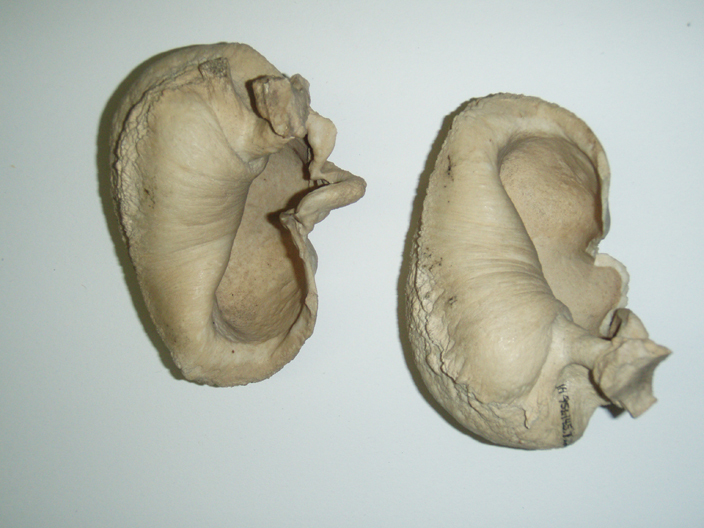 Misidentified artifacts – How to deal with these? Do you know what these are? They were identified in the museum’s records as “fossilized sea shells”, however as I had previously worked at the Vancouver Maritime Museum, I knew that they were actually the ear bones of a whale. Identify them correctly in records and record the source of the information. For example one museum had a Chinese display featuring a bucket. A visitor pointed out that the writing on the bucket was Japanese. Ooops! A correction was made in the records and it was pulled from the exhibit. Even the national museums have made mistakes. The Canadian War Museum (CWM) sent a travelling War Art show across Canada. I saw it in its last venue, the Vancouver Art Gallery. One of the paintings looked odd. If showed a bombardier in an aircraft dropping bombs but the photo looked more like a Space Station photo. I had met this particular War Artist, Paul Goranson (who lived two doors down from my mother) and he had impressed me with his desire for technical accuracy, including the fact that he flew along on bombing missions against orders. I twisted my head and body around and realized that the painting was mounted upside down in the frame! A friend came along a few minutes later and he too spotted the mistake. Paul Goranson had not signed the painting, but it was identified as his by a brass plaque attached to the bottom center of the frame. I deduced that the painting had been removed from the frame for conservation cleaning before the tour, and had been placed back into the frame UPSIDE DOWN and that it had travelled all the way across Canada that way. I checked the CWM’s web site and saw the painting in a photograph the right way up. I sent an email to the Museum Director who said they would look into it and fix it if they were wrong. A week later I received a brief message that they had fixed it. Do NOT engage in “Permanent Loans” or open-ended loans! They were the bane of my existence as a Curator. I recommend 1-year loans. At the end of the year, the borrower and lender meet or at least communicate and decide whether the item should be returned or a NEW loan form made out.